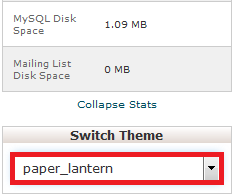 The most current cPanel theme (which at the moment is Paper Lantern) should always be used. Older themes lack the icons for newer features, meaning those features will simply be unavailable unless the theme is set to the current one. Step 2 - In the bottom left or top left of the screen you will see a Switch Theme menu option you can use to change the theme. Changes take place instantly. You can scroll down through a list of different looks/styles. Just click Apply on the one style want to select.